Since the BLOW OUT! we’ve been sailing Rode Trip with our repaired main sail. In the meantime, we (“we” a.k.a. Brian) found an appropriately sized, used main sail that we purchased through Pacific Sail Traders via E-Bay. Why used? Well for starters we received several quotes for brand spanking new mains and, WOAH, were they expensive. We weren’t surprised that a new main ranged from $2,000-$4,000 depending on the sailmaker and not including shipping or battens. Used sails ranged from $500-$1,200 not including shipping or battens. So when we found a sail at the right size and the right price we said, “Sold!” Our new/used main cost $700 plus $70 for shipping plus $70 for new battens. Our new/used main was made for a Beneteau 38′ and we hoped that when it arrived it would be ready to sail off into the sunset. As described the new/used main was in excellent condition. 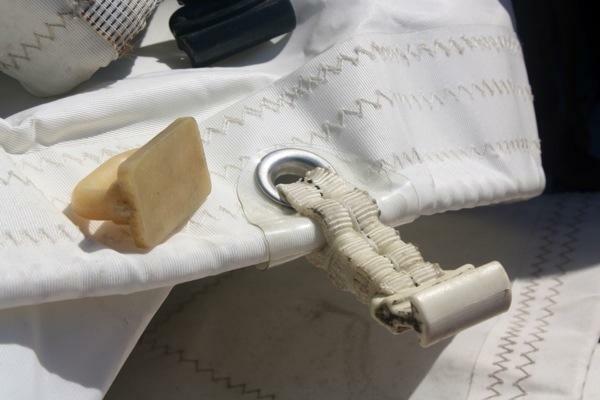 One major difference, however, from our current main sail was that this main has full battens. After consulting with a sail maker, we agreed full battens were the way to go for a cruising sail as they’d put less wear on the sail. Knowing that we couldn’t use the new/used main until it had battens, we were still anxious to get it rigged on the boat and see how it fit. I was thrilled to have something new aboard because it seemed there’d be no boat project involved and no searching for random parts. But the trade-off for cruising is saving money by using our own time and ingenuity. With the introduction of the new/used main, a project was born. We could not raise the new/used main to see how it fit because the track cars were too small for our mast track. Brian set to work changing the track cars by sewing our webbing and track cars onto the new/used sail. I was completely supportive; fetching twine, needles, webbing, etc. Once the track cars were replaced, we fitted the new/used main into the boom track but the outhaul was too short to reach the clew. 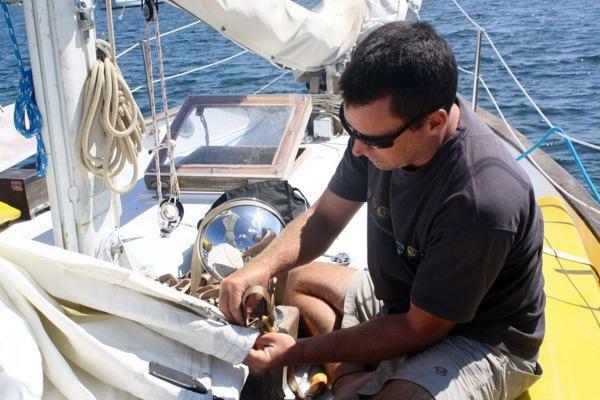 Brian set to work again removing the fairlead that was preventing the downhaul from adjusting. I was completely supportive; ignoring the upturned cushions and opened compartments in the cabin and quietly stepping over the extension cord and power tools while browsing Facebook to see if something more interesting was happening that afternoon (nothing more interesting was happening as it turns out). At last, the new/used main could be raised! I heaved on the halyard while Brian fed the track cars into the mast track. Ah hah! A lovely fit. Hmmm, we wondered how many people we could fool into thinking that Rode Trip is a Beneteau. Decidedly the decal must be removed. The new/used sail is a good fit, but we still weren’t ready to sail it. We needed to add lines to tie down the reef points and we had a small snag. The reef tacks had been made using blocks and our previous reef tacks were hooks. 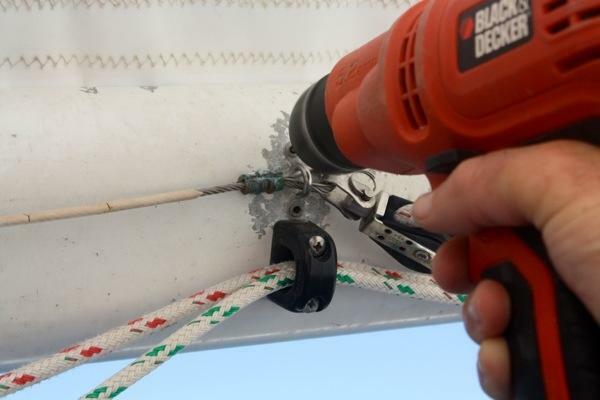 One trip to Hamilton Marine solved the reefing snag. I found discounted rope, the end of the spools, in various lenghts/colors/sizes that we could use for the tie downs on the reef points. Brian used webbing on the reef tack blocks so that we could continue to use our hooks by attaching the webbing to the hook. And so our reefing system was back in order. 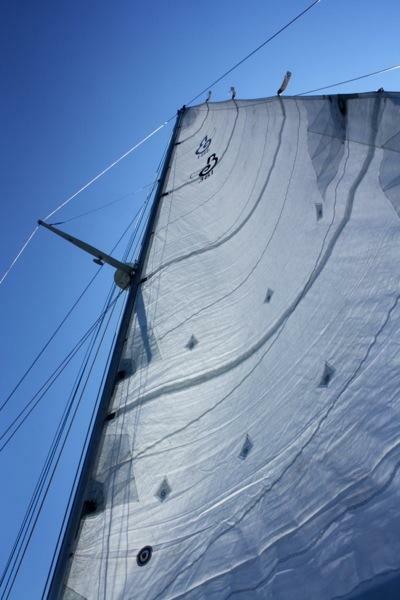 To complete the new/used sail we contacted Pope Sails in Rockland, Maine who came highly recommended. Pope Sails provided the full battens that the new/used sail required. Doug Pope was prompt and even accommodating; upon realizing that we’d walked the sail to his shop he offered to deliver the sail to the town docks for pick-up. We were pleased with his service, fair pricing, and hospitality. Finally, Rode Trip is ready to sail off into the sunset with a new/used main sail! The first voyage will literally be into the sunset was we travel from Rockland, ME to Portsmouth, NH. Brian is already looking forward to increased speed and better handling from our new/used main sail which is much crisper and flatter than our vintage main. 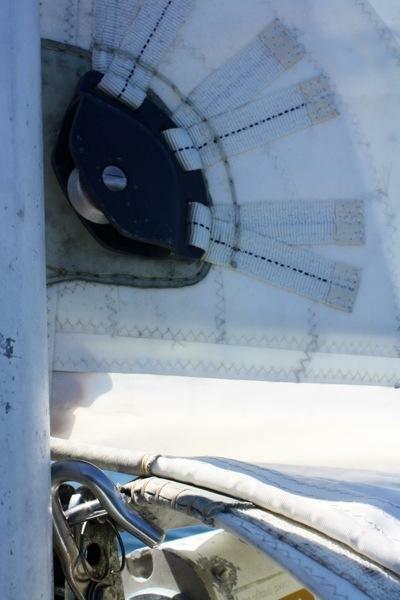 This entry was posted in Uncategorized and tagged boom, main, reef points, reefing lines, track cars by stephanie. Bookmark the permalink. Good for you both! Somebody has to keep track of Facebook, right? As Communications Officer I do take my Facebook checks very seriously.